Encounter all the animals you ever dreamt of seeing including the most elusive primate, the Mountain Gorilla. On the first day of your Uganda Safari, you arrive at the Entebbe International Airport where you will be met by a representative for the transfer to Kampala for dinner and overnight at Fairway Hotel or Ivys Hotel similar. After breakfast on your Uganda Safari you drive to the Bwindi Impenetrable Forest via Mbarara, where you have lunch at Lake View Regency Hotel. On the way you can admire the green tea plantations, the Ankole cattle and the Ugandan farms. You reach Bwindi in the evening for dinner and overnight at Bwindi Gorilla Resort - Nkuringo Lodge or Buhoma Community - Kisoro Tourist Hotel. Fullboard. On day 3 of your Uganda Safari you leave after breakfast to a site where you start trekking into the rain tropical forest at 8am. Follow the briefing from the ranger guides. The forest is spectacular as it offers a dramatic, heavily dense landscape criss crossed by numerous animal trails, allowing access for tourists. 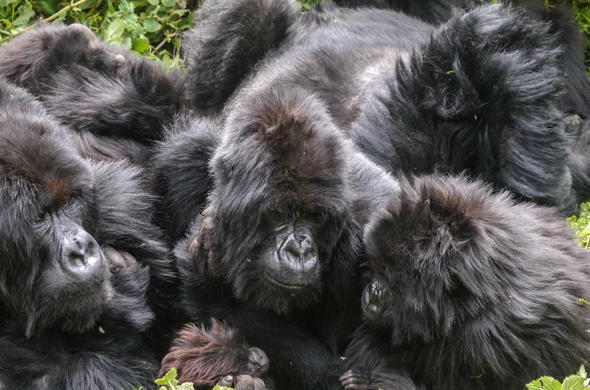 This park is best known for the fascinating Mountain Gorillas. The time taken to reach them and the terrain vary according to the movements of these marvelous primates. The thrill of spending time with and observing the Gorillas is a rare, moving, awesome and exciting experience. The Gorillas are shy and peaceful animals and it is an unforgettable experience to watch and photograph them as they interact with each other. Dinner and overnight at Savannah Hotel. Fullboard. After breakfast on your Uganda Safari you reach the Ishasha Sector of Queen Elizabeth National Park. In the afternoon go for the game drive in the open savannah covered by Acacia trees on the edge of the Albertine Rift Valley. You will search for the typical tree climbing Lions, a population which is found only in this part of the country. It is impressive to see the animals while they are resting on top of the fig trees. Proceed to Mweya Safari Lodge Mweya Hostel for dinner and overnight. On day 5 of the Uganda Safari enjoy a cup of coffee then embark on an early morning game drive along the Kasengi and Queens mile tracks in the park. Expect to see Lions, Elephants, Cape Buffalo, Warthogs, Leopard, Spotted Hyena, Mongoose, Waterbuck, Uganda Kobs, Topi and lots of small animals and birds. Return to the lodge for breakfast and relax at the swimming pool. After lunch board the boat cruise for the best navigation of the Kazinga Channel. This is a good opportunity for birding, as you will see many water birds, Cormorants, Pelicans, Eagles, as well as Crocodiles, Hippos, Elephants. In the evening you proceed to Fort Portal for dinner and overnight at Nynabulitwa Country Resort or Fort Motel. On day 6 of your Uganda Safari you first have breakfast then you drive to Kibale National Park for the chimpanzee and primate trekking in the forest. Here is found one of the largest populations of chimpanzees in Uganda. After lunch in Fort Portal return to Kampala for dinner and overnight at Hotel Africana or similar or Ivys Hotel. Your Uganda Safari comes to an end. The Equator divides the northern and southern hemispheres. Stand with a leg in each hemisphere, and take a photograph! Tribes of Uganda are classified in five major language groups; Bantu, Nilotics, Madi - Muro, Highland Nilotics and Nilo - Hermits.